In New England we love fall. We love pumpkin flavored coffee, football, bonfires, and hoodies. But the one drawback about autumn is that with the change in the weather, the grass begins to die, the leaves begin to drop, the flowers stop blooming, and our landscapes become less and less attractive. This is where seasonal displays come in. Seasonal landscaping or displays are temporary designs which are intended to last for the season, and will accent the tone of the current season. For Christmas, this of course involves Christmas trees or some evergreen variation, along with other appropriate decorations such as bows, mistletoe, red and green ribbons, etc. For fall, a display made of hay, pumpkins, cornstalks, etc. can be very attractive. Retail stores are notorious for their excessive and early decoration. This can be a turn off to some people, however there is a reason they do it. Retailers make a large portion of their profit during the holiday season and therefore want to stretch it out as long as possible. It also serves as advertising for similar products or décor. You may not be a retailer, but the physical appearance of your business can help it to stand out. Just as the house with Christmas lights draws the most attention on the street, a business with a seasonal display can stand out from its neighbors. When done tastefully, a display can go a long way to improving your sales. 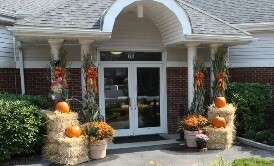 There are several times a seasonal display will add a nice touch to the appearance and culture of your business. Autumn, Thanksgiving, and Christmas are three in particular. 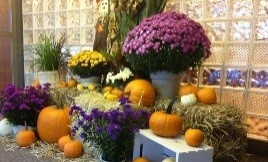 Autumn & Thanksgiving Displays: Fall displays are very are safe bets because most people enjoy fall. The traditional staples of hay, pumpkins, squash, colored leaves, and tall sunflowers are an excellent base to work with. Anything rustic and outdoorsy will fit in. Thanksgiving displays are mostly similar to the autumn displays, but you can add a few things which are specific to the holiday such as turkeys, pilgrim hats, and football. Note: you may want to be careful with Halloween displays as going overboard in the creepy department can be a turn off, especially excessive cobwebs. Christmas & New Year’s Displays: The key with Christmas is to be tasteful. Christmas is marketed with unbelievable excess these days. With this in mind, try picking a particular theme. This should match your office or business feel. If you more professional, try traditional themes. For a more lighthearted business, try something with a little more personality. A warm and welcoming about a tasteful and colorful display which will make the entrance to a business or home leap to the eye from all the shabby colorless surroundings. Whether you are thinking about a beautiful fall display or planning for a winter or holiday display, Greener Horizon in Middleboro MA, understands how important it is to stand out in today’s business world. In addition to seasonal displays, we provide the full spectrum of landscaping services such as retaining walls, patios, outdoor kitchens, and commercial snow and ice management. Be sure to contact our expert team so we can walk you through the process, answer any questions you may have, and schedule a complementary consultation.